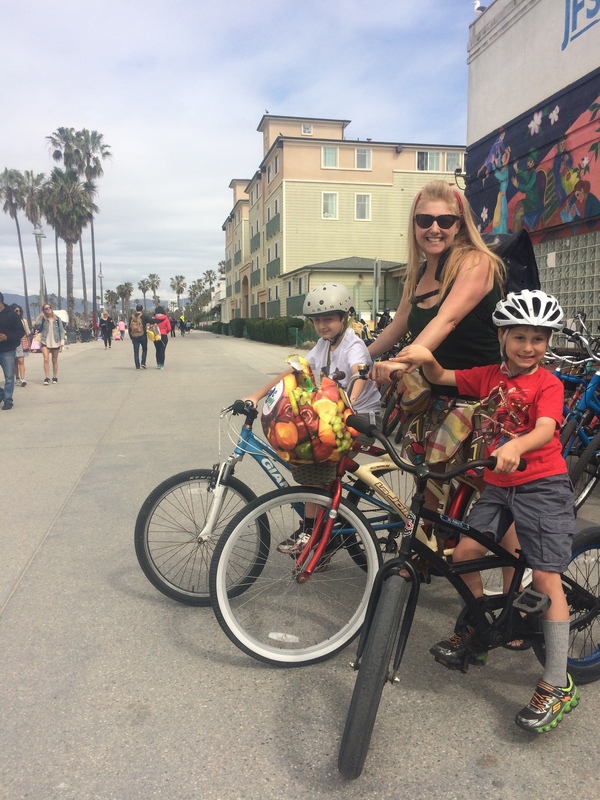 After biking with kids in Santa Barbara for an hour one day at the beginning of spring break, we had a second bike adventure: two biking hours in Venice Beach. The apartment at which we were staying came with two adult-sized beach cruisers so I was set for wheels and the closest of the many bike rental places–just four blocks along our street at the beach–had a couple kid bikes that should be available if we showed up near 10am opening. 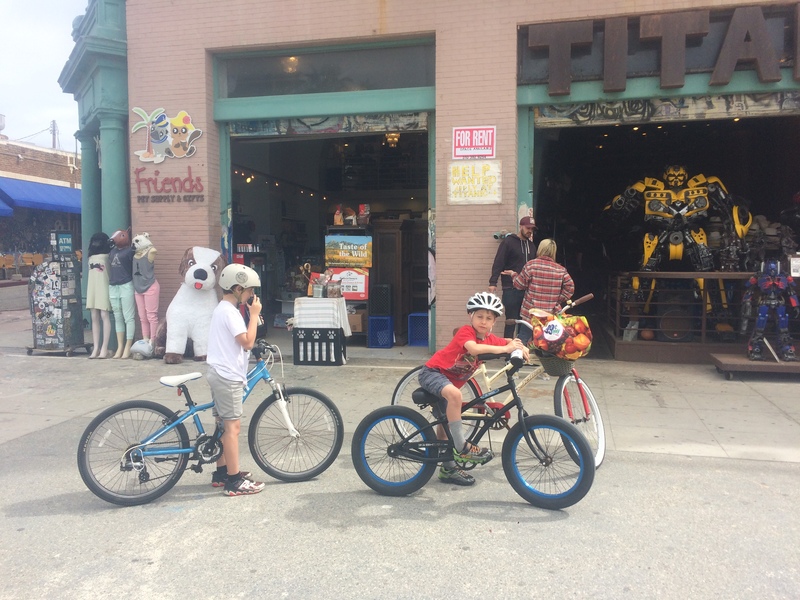 My seven-year old got a cool-looking 20″ cruiser bike and my nine-year old got a 24″ mountain bike–his first bike with a front derailleur, but I don’t think he did any shifting. As I mentioned in my last post, there are lots of options for kids these days. Santa Monica Bike Center is particularly awesome with cargo bikes, kid-friendly tandems, trailers, trailer bikes, bike seats, and kid bikes. It might have been worth looking for an apartment within walking distance of SMBC, but I didn’t think of that when planning our visit. As wonderful as the place looks, it wasn’t worth driving there from two miles away. So we walked to the close place, got the two bikes and were rolling right away. 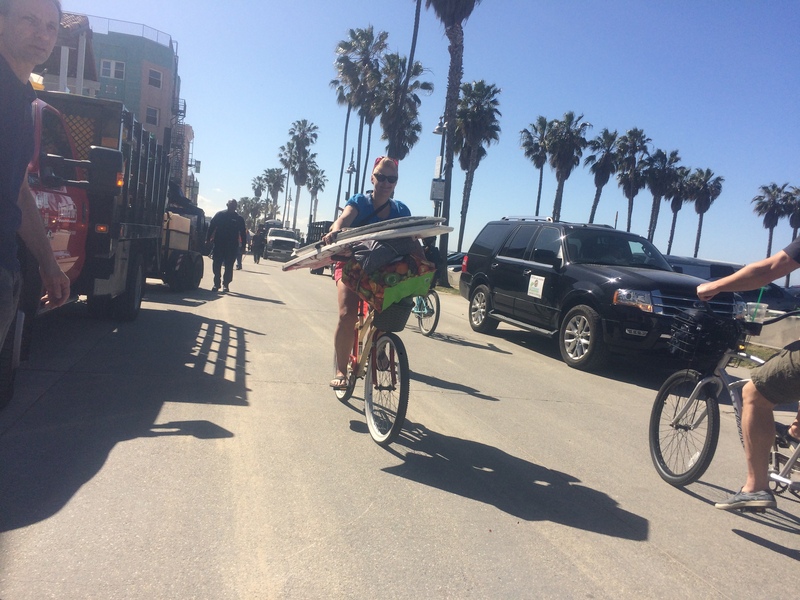 We started by riding one mile south to Muscle Beach. It was a little early in the day for weight lifters so the kids didn’t get to see it in all its glory. 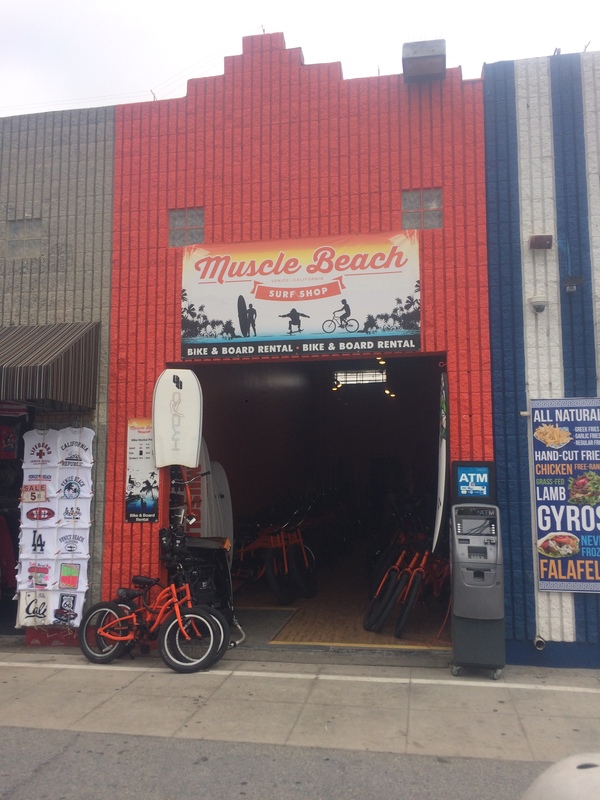 But I thought Muscle Beach Surf Shop was pretty cool: they have orange–and only orange–rental bikes! 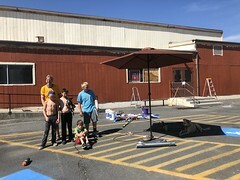 Kid bikes of all sizes, regular bikes, fat bikes, an orange trailer, and an orange Burley Piccolo trailer bike. It looked like all the rental places’ trailer bikes were Burley Piccolos and Kazoos. We use a Burley Piccolo at home and love it. The Piccolo (has gears) and Kazoo (no gears) mount to a rear rack for an incredibly stable ride. We had one of the seat-post-attaching trailer bikes before and I simply wasn’t strong enough to bike with it comfortably. I notice lots of kids on those tilted to the side, though I also know people who love theirs. 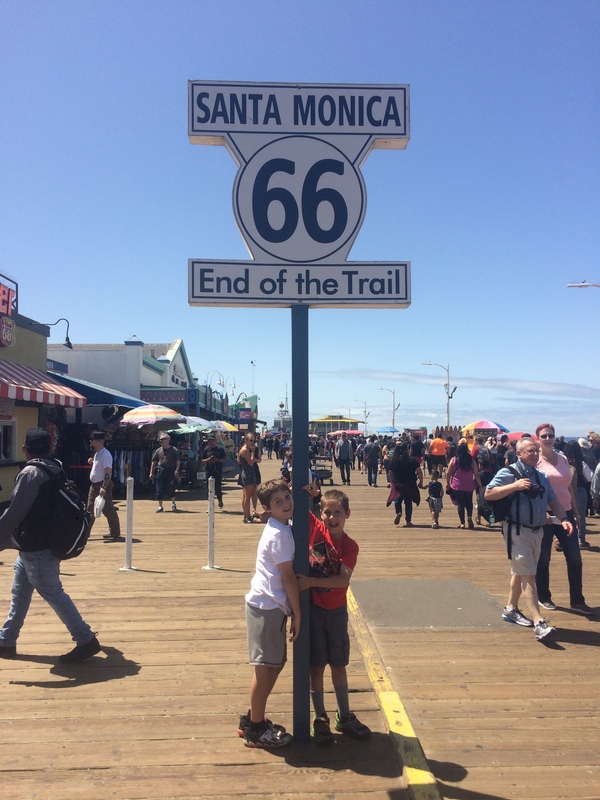 After Muscle Beach we biked nearly three miles in the other direction to the Santa Monica Pier. It was a long haul for the kids on unfamiliar bikes, but we made it. And after eating and resting, my younger and unhappier camper was back to normal! So we rode back to the rental place, ditched the bikes and headed for the beach. That’s what I mostly used my own bike for all week: as a hand truck to ferry stuff to water’s edge. I did a tiny bit of biking for the sake of 30 Days of Biking and the day after our rental adventure we brought boogie boards to the beach and I discovered how convenient it is to have a single speed and coaster (foot) brake: my hands had no tasks other than pinning stuff to the handlebars so I could steer. I could have carried way more stuff. All week in Venice we saw so many families on so many bikes! I assume most of them were visiting town and only riding back and forth along the bike trail, just like us. I wished I could tell them all that they could have this fun experience back home, too. I hope some of them will. After all, that’s how many full-time family bikers I know got started: visits to bikey places (for instance: Copenhagen by Hum of the City and visiting my family in the Netherlands in mine) and wanting to replicate the joy and freedom of getting around by bike once back at home. Thank goodness one doesn’t have to cross an ocean to catch the family biking bug anymore! Despite our two days of using bikes over spring break and my teensy bit of biking the other days, we did a lot of driving. Back in 2010 I read Los Angeles on $100 a Day by New York Times Frugal Traveler Seth Kugel and discovered one can avoid driving while visiting LA! Now I know people who live without cars there, but this was my first exposure to anything like that. I would love to do that someday. I went down once without the kids with a rental Brompton folding bike and didn’t need to rent a car, but I was chauffeured around by my family so that was hardly a car-free visit. At least our staying within walking distance of the beach and restaurants of Venice Beach meant we were able to do half our stuff without the car, which is better than some visits where we’ve had to drive for each and every thing. Last time we stayed in a hotel walking distance to the La Brea Tar Pits and The Grove so again we were able to do some walking, but still had to drive a lot. I think if I ever want to make this work, I’d need to find a bus stop near my brother’s house and examine where I could get easily from there to choose where we’d stay. Then I’d need to choose all the various places we could get from our hotel or apartment and set up an itinerary for the week and hope our family and friends were game to meet up with us in convenient places. But this would be just biking and bus- or rail riding, no bikes. But I’m eager to look into it next time we visit.